Sideshow have revealed their new Premium format figure of Cassandra Peterson’s famed horror hostess Elvira- Mistress of the Dark! The buxom wench known the world over for her witty asides while introducing movies (as well as two feature films of her own and a popular comics series), will soon be available as a high quality collectible figure. From the gallery photos Sideshow have posted, she is looking as gorgeous and kooky as ever, and with the stylized sculpt she has been given is sure to win over the hearts of her adoring public all over again. I love this piece. The expression on her face is absolutely priceless, and it pleases me that this bastion of 80s horror kitsch is still popular today. The Elvira- Mistress of the Dark premium format figure from Sideshow is to ship in the 2nd quarter of 2009, but can be pre-ordered from their site now. Standing at 19 inches tall, the piece is to be of a limited edition, yet the exact number is yet to be announced. The diorama base looks perfect for the piece, and while the facial sculpt isn’t perfect, it does capture the essence of this well loved character very well. What a pair of… eyes! This is actually incredibly unnerving. From the brand new hit comic book movie HELLBOY II: THE GOLDEN ARMY comes a terrifying creation that wouldn’t have looked out of place in director Guilermo Del Toro’s masterpiece Pan’s Labyrinth. Due to be a big hit with fans of the movies and the Hellboy comics franchise, the Angel if Death is one of the most striking characters to come to genre movies in recent years. Sideshow are now bringing us this huge and fantastically detailed bust of the chilling entity as seen in the movie itself. 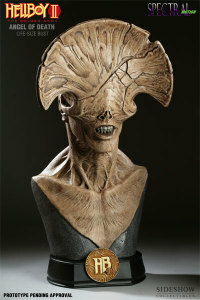 The Angel of Death Life-size Bust from Hellboy II is an incredibly imposing piece of sculpted memorabilia, and with the impact of the new film is set to become a highly sought after collectible. Hand finished and hand numbered, this magnificent item is a limited edition of an as yet unknown number. Get this though- the piece is to stand 24 INCHES high. Yes. 24 inches. Due to ship in the 4th quarter of 2008, it is now available to pre-order from Sideshow themselves. Okay, I’m not too sure about this one. It does look cool, but it also looks faintly ridiculous. The Predator is meant to be a lone warrior, using its own speed, strength and agility to hunt and bring down its prey. Here we have a Predator on horseback, looking like a cross between something from Lord of the Rings and Warhammer 40K. The horse seems to have been sculpted from a traditional, earthbound animal but then had its skin stripped off. Ouch. It is definitely an impressive piece, but I do think it looks a bit silly, even for a Predator piece. Originally only available in Japan, the Predator on Horse statue is to be made available in the West for the first time by Sideshow, in a limited quantity. The item is to stand in excess of 14 inches tall, and features an excellent sculpt that errs more on the side of fantasy art than the old school badass aliens that Predators are usually cast as. Odd as the design may be, Sideshow have lavished it with their customary high levels of craftsmanship, and the sculpt and paintwork look amazing. The musculature of the horse beast doesn’t quite look 100 percent right, but it still looks suitably meaty and unnerving. The Predator on Horse statue is due for release in the first quarter of 2009, and the limited edition run is yet to be announced. I’m guessing it will be somewhere in the 250 region.